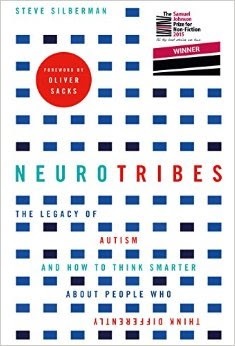 Steve Silberman’s Neurotribes was the recipient of this year’s Samuel Johnson Prize for Non-fiction writing and the first winner classified as a science book to do so. However, do not be misled by this categorisation into thinking of this work as a technical, scientific text. Neurotribes covers an array of issues including the history and politics of scientific research and a tender exposure of the impact that these have on the people affected. It is a fascinating and comprehensive look into the history of and attitudes towards autism. Silberman’s far-reaching and in-depth research traces examples of historical figures who showed signs of autism, the genesis and development of its diagnosis and the often opposing beliefs regarding what can best be done to help those who are autistic. From the loss of Hanz Asperger’s research amidst the eugenics-fuelled Nazi purge of the ‘intellectually inferior’ to the discredited research of Andrew Wakefield linking the MMR vaccine to autism, Silbermen weaves almost 100 years of scientific research with tales of individuals and families struggling to understand the challenges facing them. In the 1940s it was Leo Kanner in the US who became the leading voice in autism research. He believed that it was a rare disorder and his ambiguity over whether it was inborn or externally-caused spurred many, from psychotherapists to gastroenterologists, into a search for a cause and a ‘cure’. This has resulted in psychotherapy for the parents of autistic children and the institutionalisation of many autistics, as well as a dazzling array of diets being sold as cures. At the same time as Kanner’s initial research, Hanz Asperger in Vienna was recognising that autism covered a far wider spectrum of behaviours than Kanner included in his diagnosis and that its destructive effects could be lessened through individualised education. Asperger also recognised the intellectual capabilities present in his research subjects, calling them his “little scientists”. Unfortunately, much of Asperger’s work was lost in the German occupation and people were keen to distance themselves from any perceived connection between his work and Nazi eugenics. As such, his published articles were not referenced by Kanner or translated into English until many years later. In fact, it wasn’t until the late 1980s that a much wider definition and range of behaviours, the autism spectrum, finally became the accepted diagnostic tool. Researchers, autism advocates and physicians like Lorna Wing in the UK fought for this extended classification in order to gain support and services, such as access to education, for the many people and families dealing with the day-to-day issues of living with autism. This, together with the first high-profile mainstream representation of an autistic person in the form of Raymond Babbitt in Rainman (1988), resulted in a greatly increased incidence of reporting of cases in the 1990s, leading some to claim that there was an “autism epidemic”. This coincided with Wakefield’s now debunked report into the MMR vaccine and, in a ‘perfect storm’ of circumstances, an erroneous connection was drawn by autism support groups, researchers and parents who still thought of autism as an illness rather than a genetic anomaly, grasping at any possibility of discovery of a cause and a cure. The resulting panic led to a drop-off in numbers of children being given the MMR vaccination and an increase in cases of potentially-fatal measles. Unfortunately, the fraudulent claims of Wakefield’s report are still dangerously perpetuated today by high-profile figures, including Donald Trump. Lorna Wing had stressed the importance of classification, saying “nothing exists until it has a name”, but this has also had unintentional and potentially devastating consequences. Society’s compulsive drive to classify can be traced back to the origins of empirical science, with the likes of Newton and Bacon in the 17th century, then fully coming into its own in the 18th century Enlightenment. Carl Von Linnaeus’ classification of plants (1735), Antoine Lavoisier’s classification of the chemical elements (1789) and Diderot’s Encyclopèdie (1751) are all examples from this period of the natural philosophers’ attempts to label and control all the elements of the world around them. Over 250 years later and the world we live in is still highly organised into categories, with books, movies, music, illnesses, beliefs and people all labelled and classified. Undoubtedly such labels can have their uses, whether it be to help us choose which movie to watch, to gain access to health care or to give power and legitimacy to a movement, such as LGBT. However, such categories oversimplify the complexities of the world around us and often organise us on unrepresentative binary lines: left-wing or right-wing, gay or straight, male or female, able or disabled, normal or abnormal. Autism has historically been classed as a mental illness, a psychological disorder, a handicap, a form of childhood schizophrenia and has been given the names Asperger’s Syndrome and Autism with the quantifiers high-functioning and low-functioning. With each of these labels comes a stigma and very clear boundaries as to who belongs and who doesn’t. However, Silberman’s book ends on an optimistic note which has much to do with the eventual acceptance of Asperger’s idea of autism as a spectrum of behaviours. Self-determining autistics have adopted the term “neurodiversity” to explain the differences between people as a limitless variety of behaviours, impulses, intellects and capabilities to which we all belong. This seems to be resulting in a new understanding and acceptance of what being autistic really means, with a focus on potential and inclusion. It is this concept of diversity, range and acceptance of infinite difference which needs to be applied not only to our neural variations but to all aspects of our identities and beliefs which defy classification.